Bags of white sugar are displayed in a supermarket. For decades, research suggested that we should limit the amount of fat in our diets, but the latest medical thinking labels sugar as the real health villain. Instead of avoiding fat, some cardiologists are encouraging patients to “embrace full fat dairy and other saturated fats”. Meanwhile, health experts and campaigners have set their sights on sugar, with calls for a tax on sugary drinks. According to recent reports, just one sugary hot drink provides more than double your recommended daily intake. Research from the World Health Organisation has found that free sugars (that is, any sugar added to food or drinks, or found naturally in honey, syrups, and fruit juices), particularly in sugar-sweetened beverages, increase your overall energy intake and can lead to an unhealthy diet, weight gain and an increased risk of noncommunicable diseases (NCDs), such as diabetes and heart disease. Sugar consumption has also been linked to diabetes and heart disease in children – Dr Robert Lustig, childhood obesity expert, author and "no sugar" advocate, found that “added sugar is 11 times more potent at causing diabetes than general calories". Sugar has also been linked to cancer. A 2013 study found that sugar consumption could trigger the formation of the hormone gastric inhibitory polypeptide (GIP) that increases insulin levels. Insulin resistance has a well-documented connection with cancer. On top of all this, we all know that excessive sugar intake causes tooth decay. Is sugar consumption on the rise? 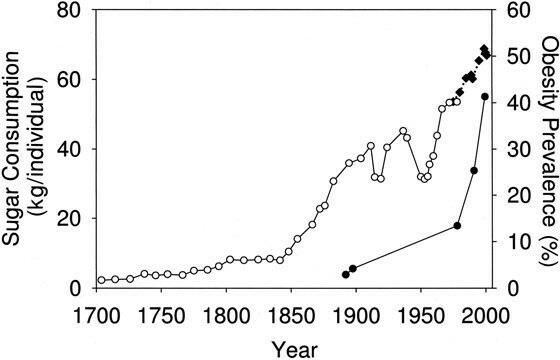 Prior to the 19th century, sugar was a rare commodity, but with the introduction of new techniques to extract it the industry boomed, growing from a quarter of a million tons in 1800 to 8 million tons in 1900. Since then sugar consumption has increased steadily. By 1993, more than 110 million tons of sugar was produced globally. And the amount of sugar we consume is still rising. Worldwide, we have increased our yearly sugar intake by almost 20 million tons since 2009, as the chart below shows. The World Health Organisation recommends that adults should consume no more than 25g, or six and a half teaspoons, a day. Despite this, studies consistently show that average sugar consumption far exceeds recommended limits. One study found that, as a region, Asia is responsible for almost half of the world’s total sugar intake. Meanwhile, in the United States people have a fondness for sugar, with one survey showing that the average American consumes 126g every day – more than five times the recommended limit. 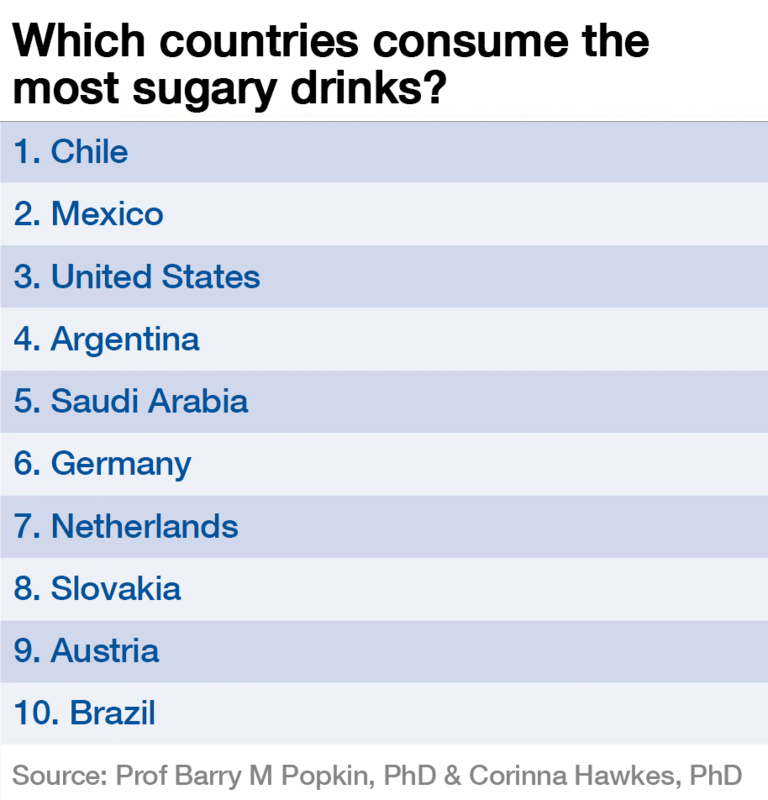 Latin American countries are also big consumers of sugar. Research shows that Brazilians consume, on average, 152g of sugar, and Mexicans more than 100g per day. The high levels of sugar consumption in some Latin American countries could be explained by the popularity of sugary drinks in the region. Sugary drinks have been highlighted as a major contributor to overall sugar intake, especially among children. For young people aged 11-18, 40% of added sugar intake comes from soft drinks. Children consume 30% of their added sugar from sugary drinks, compared to only 25% for adults. Do we need a tax on sugar? In an attempt to reduce the consumption of sugar, and especially sugary drinks, governments around the world have implemented strategies including taxing sugary drinks. Mexico implemented a 10% "sugar tax", resulting in a 12% cut in consumption of sugar-sweetened drinks. France and Chile have introduced similar taxes, while other countries including Indonesia, India and the Philippines are looking at implementing taxes on sugar. According to a report from Cancer Research UK and the UK Health Forum, a tax on sugar-sweetened drinks in the UK could save 3.7 million people from becoming obese over the next 10 years. The tax is backed by more than half of the UK public surveyed. The health effects of excessive sugar consumption, such as obesity and the risk of developing conditions such as heart disease and diabetes, places a heavy burden on healthcare systems around the world. In the US, the medical costs resulting from obesity and weight issues are estimated to be almost 10% of total healthcare expenditure. A McKinsey report found that in 2012 the total economic loss to the UK from obesity amounted to £49 billion. The report found that a tax on sugary drinks would be beneficial for the UK’s economy, reducing health and social care spending by £10 billion a year.